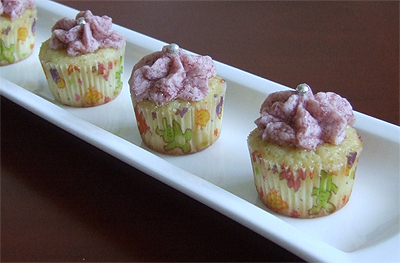 These cupcakes may not be the prettiest little things you've ever seen. And granted, most of the time my cupcakes aren't beautiful works of art. Having had no professional training in the art of cake decorating, and with my patience usually having long worn-off by the time I get around to icing my cakes, I usually just slather it on with a palette knife or simply squirt it on top. My "ugly cake" dilemma continues if I choose to make a buttercream, which more often than not seems to split on me. Some have told me that my ingredients might not too cold, which leaves the milk as the culprit if that is so. Others have suggested that I chill down and re-whip (which is not really conducive to my lost patient I mentioned earlier). So, these cupcakes turned out just a little fugly, which I tried to salvage by placing silver candy balls on top. Regardless of how they looked, they were still really delicious. 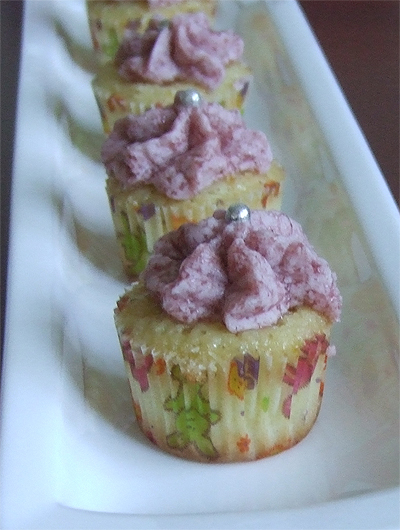 I used this recipe for the cupcakes, which turned out moist with a light and fluffy texture. For the buttercream, I simply added raspberry jam to a standard buttercream recipe. Using jam rather than fresh raspberries gives a more concentrated flavour to the buttercream. They were so good with the vanilla cakes, but they would equally be as delicious with lemon cupcakes as well! Sure, they may not win any prizes for appearance, but in the end, taste trumps looks any day, right? Posted by Bonita at 8:53 p.m.